At least it’s somewhat healthy, right? I am a notorious snack-er. I would much rather snack than eat a meal. Sometimes I get that craving for something real nice and healthy, like a salad or a veggie-laden wrap of some sort. But for the most part I’d choose a bag of veggie chips over cooking a meal, any day. I don’t know where I got these insanely poor eating habits from. Probably from my parents who used to keep their own stash of goodies hidden throughout our home. (Sorry Mom & Dad.) Well, the goodies weren’t hidden too well. To this day my younger sister can tell you the various areas in which she’d find buried treasures — and that was nearly a decade ago! On with the story…. Today I took my 22-month-old out and about. We stopped at Trader Joe’s to get groceries because I haven’t been there in like a year. No lie. I wanted to get some healthy, ‘organic’ eats, and see what new items I could snag for my snack habit. Thank God I saw my all time favorite Snap Pea Crisps. Of course I grabbed 2 bags because who knows when the next time I’ll shop there. Not that two bags would last me a year. I seriously could smash two bags in a day if I wanted to! No lie. So as we’re strolling down the aisle I come across something new and adventure-worthy. 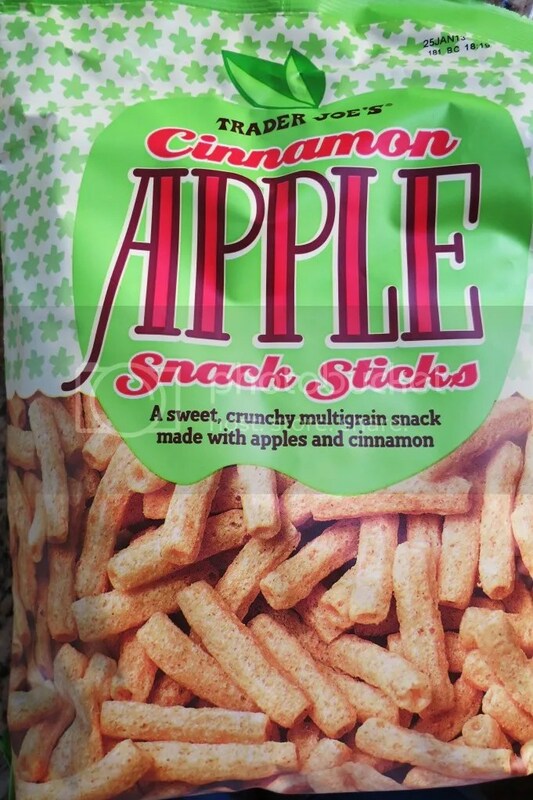 Trader Joe’s Cinnamon Apple Snack Sticks. Hmmmmm. IDK… Apple? Cinnamon. Chip? Crunchy?? My interests were piqued so I threw a bag in the cart. Speaking of carts —– You know how Trader Joe’s has those little carts for your children to push throughout the store? Well I decided to let my son have a go at this since he LOVES pushing the adult-sized carts. Well… What’s a nice way of putting this?… NEVER AGAIN! He would stop mid isle. Leave the cart. Venture around. He even tipped over the cart once. But that might have been partially my fault because I started piling groceries in the little thing. Who knows what the weight limit is? LOL. I eventually got bored with his shopping cart pushing efforts and opted for the real deal. Once we finished our escapade we returned home. The toddler went down for a nap. And I popped open my bag of Cinnamon Apple thingies. All I have to say is: DELISH! And: MUST TRY! I am in no way getting paid to endorse this product so it’s not like I’d be winning brownie points if you decided to give ’em a try. Just take my word for it. If you’re looking for a healthy snack that won’t send you into diabetic shock and is actually edible you’d, definitely enjoy these! Photo courtesy of Peanut Butter and Peppers. Click photo for Nutrition Facts. I’m always looking for yummy, yet healthy snacks. What’s your favorite Trader Joe’s snack? I wanna try it. Categories: Healthy Eats | Tags: apple cinnamon, baked snack, healthy snack, low glycemic snack, organic snack, sweet chips, trader joe's, trader joe's cinnamon apple crunch sticks | Permalink.